Roger's Reference - The Only Complete Homonym and Homophone Dictionary! Hi ... Roger Burke here. Find any homonym or homophone in Roger's Reference, quickly and easily. Remove all confusion about English words that sound the same - they're here, fully cross-referenced, with meanings. Eliminate tiresome searches through your regular dictionary for homonyms and homophones. As you know, English is a tough language to learn, even for those who are born into it! Many native English speakers often confuse the meanings and spellings of words that sound the same. That's why we developed our e-book as a reference tool for anybody who wants help in that area. And, we figured that it might also be of interest to those who learn English as second language. As an additional spur to the development of the e-book, we have a passionate interest in language, and years of playing and testing word puzzles and games; so, we think it's a lot of fun, too! Our Reference Dictionary Is So Comprehensive, You'll Never Be Stuck For The Right (Write, Wright, Right, Rite) Homonym Or Homophone. You'll find it to be a very useful and quick reference tool. Here, you have the most up-to-date alphabetical list of every word (that we have collected) that has a phonetic twin, together with all word definitions. those concerned with philology, linguistics and lexicography. For a full explanation of the e-book's contents, and some sample pages to review, please click here. 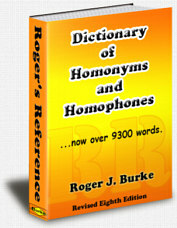 With 9370 words (and growing), Roger's Reference is by far the most complete dictionary of homonyms and homophones now available. Order Roger's Reference Ebook Now For Only $2.99! No more tedious searching, no more confusion, no more time wasting, ... don't delay any more! After purchasing, you'll be redirected to the necessary download link page at this site. And remember, your privacy is guaranteed; please read our full privacy statement here, if you have any concerns or reservations.